Remove the steering gear boot. Refer to Steering Gear Boot Replacement. Do not change the steering gear preload adjustment before moving the inner tie rod from the steering gear. Changing the steering gear preload adjustment before moving the inner tie rod could result in damage to the pinion and the steering gear. Place a pipe wrench on the flats of the steering gear rack. Position the pipe wrench between the steering gear housing and the steering linkage inner tie rod housing. Place a wrench on the flats of the steering linkage inner tie rod housing. 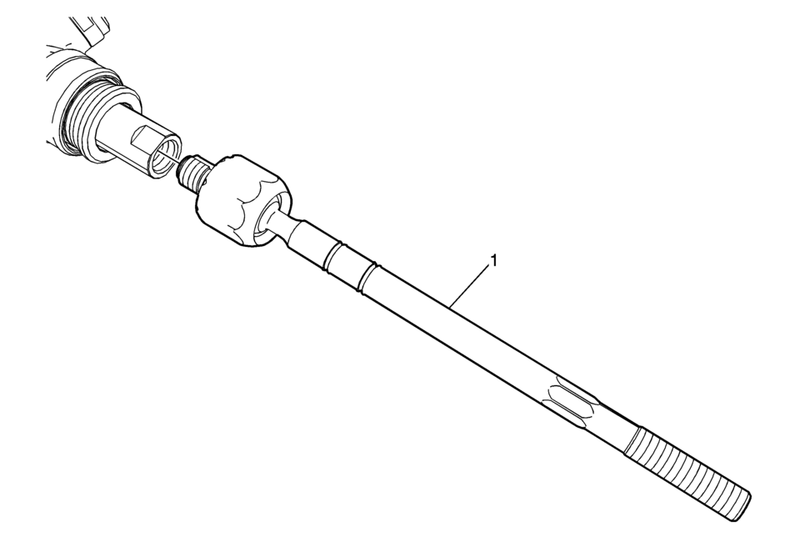 Rotate the steering linkage inner tie rod housing counterclockwise in order to remove the steering linkage inner tie rod from the steering gear rack. Apply thread locking adhesive to the steering linkage inner tie rod threads prior to installing it to the steering gear rack. Refer to Adhesives, Fluids, Lubricants, and Sealers. Rotate the steering linkage inner tie rod housing clockwise in order to install the steering linkage inner tie rod to the steering gear rack.